Market Monetarists like David Beckworth have long argued that the European crisis is not really a debt crisis or a fiscal crisis, but rather a nominal crisis. The crisis has been triggered not by too much debt, but rather than by overly tight monetary policy and the resulting drop in nominal GDP. Recently tensions in the European markets has eased dramatically and this have strongly supported the overall sentiment in the global markets. So while the media attention to some extent still is on the Greek crisis the markets seem to have moved on. 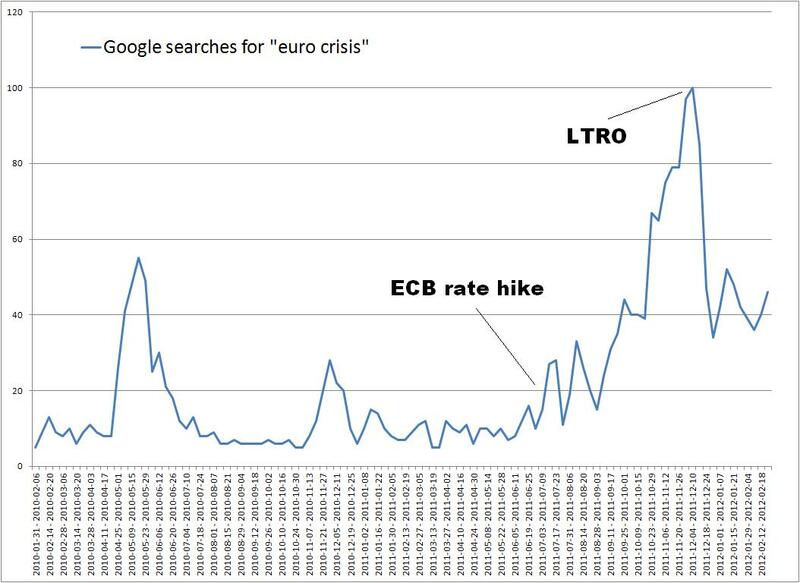 A way to illustrate this is to look at Google searches for the “euro crisis” (take a look at Google Insights – its a great tool!). See graph below. Since the December 8 annoucement the Google searches for “euro crisis” have dropped dramatically. This in my view is a pretty strong confirmation of the Market Monetarist position: The real crisis is nominal! I have not yet had time to read it all, but my initial impression is that Adolph provides some very interesting insides to what motivates central bankers, but have a look for yourselves. Adolph also has new book in the pipeline: “The Myth of Neutrality: Bankers, Bureaucrats, and Central Bank Politics” which will be published by Cambridge University Press. A new TV series from PBS will be celebrating Milton Friedman. Have a look at the trailer. I am surely looking forward to this! PS Recently I had the honour to met Bob Chitester who produced the original PBS series with Milton Friedman “Free to Choose”. Bob is founder and president of Free To Choose Network. What can Niskanan teach us about central bank bureaucrats? Numerous studies have shown that prediction markets performs remarkably well. For example prediction markets consistently beats opinion polls in predicting the outcome of elections. In general the wisdom of crowds is an extremely powerful tool for forecasting and there no doubt the markets are the best aggregators of information known to man. Market Monetarists advocate using the power of prediction markets to guide monetary policy. Scott Sumner of course is advocating using NGDP futures in the implementation of monetary policy (as do I). Furthermore, I have advocated that central banks replace their internal macroeconomic forecasts with prediction markets and also that central banks could use Robin Hanson-style prediction markets to choose between different policy instruments in the implementation of monetary policy. The advantages of using prediction markets are in my view so obvious that one can only wonder why prediction markets are not used more by policy makers – not only in monetary policy, but just think about the endless discussions about “climate change”. Why have policy makers not set-up prediction markets for the outcome of different “climate initiatives”? I think the explanation have to be found in public choice theory. William Niskanen argues forcefully in his classic book on “Bureaucracy and Representative Government” (1971) that bureaucrats are no different from the rest of us – their actions are determined by what is in their own self-interest. Niskanen claims – and I think he is more or less right (I used to be civil servant) – that that implies that bureaucrats are maximizing budgets. So how do bureaucrats maximize their department budgets? Well, it’s really simply – they use asymmetrical information. Take what is now called the Department of Homeland Security in the US. The job of the Department of Homeland Security’s is to monitor the risk of terror attacks on the US and implement policies to reduce the threat against “homeland security” (whatever that is…). If the Department of Homeland Security can convince the US taxpayers that the US faces a massive terror threat then the department is more likely to get allocated more funds. So if the Department of Homeland Security bureaucrats want to maximize their budget then it just have to convince the American public that the US faces a very large terror threat. The average US taxpayer does not really have a large incentive to go out and find out how big the terror threat really is and remember as Bryan Caplan tells us that voters tend to be rationally irrational (they don’t really have an incentive to be rational in terms of political issues) and as a consequence the average US taxpayer would happily accept any assessment made by the Department of Homeland Security about the level of the terror threat. Hence, if the Department of Homeland Security overestimates the terror threat it will be able to increase its budget and as the Department has superior knowledge of the real threat level it can easily to do so. This of course is just an example and I have no clue whether the authorities are overestimating the terror threat (I am sure my US readers will be happy to tell me if this is the case). Hence, a bureaucrat can according to Niskanen’s theory maximize its budgets by using asymmetrical information. However, there is a way around this and reduce the power of bureaucrats. It is really simple – we just introduce prediction markets. Lets say that we set up one prediction market asking the following question: “Will more people die in terror attacks than in will die in drowning accidents in the US in 2012?” – Then this “terror/drowning”-prediction could be used to allocate funds to the Department of Homeland Security. My guess is that we would be looking at major budget cuts at the Department of Homeland Security. What do you think? Anyway, my concern is not really the Department of Homeland Security, but rather monetary policy. If you think that the bureaucrats at the US Department of Homeland Security would use asymmetrical information to increase their budgets what do you think central banks around the world would do? Why would you expect central bank’s to pursue any given economic target in the conduct of monetary policy? And why would you trust the central banks to produce unbiased forecasts etc.? Why is it for example that the Federal Reserve is so reluctant to formulate a clear nominal target? Could it be that it would not be in the bureaucratic interest of the institution? Could it be that central bank bureaucrats are afraid that they would be held accountable if they miss their target? I don’t know if it is so, but if not then why not just formulate a clear and measurable nominal target? For example a target to increase nominal GDP by 10% by the end of 2013? And why not then use the opportunity to set up a NGDP futures markets? And why not let prediction markets take care of the Fed’s forecasts? I am not saying that Ben Bernanke and his colleagues are Niskanen style bureaucrats, but if they want to prove that they are not then I am sure that Scott Sumner or Robin Hanson will be happy to advise them on setting up a NGDP futures market (or any other prediction market). PS The so-called Policy Analysis Market (PAM) actually was meant to be used to among other thing assess the global terror threat. The project was shot down after political criticism of the project. PPS our friend Scott Sumner is not all about monetary policy – he has also done research on how to use Prediction Markets to Guide Global Warming Policy. Every other month or so Scott Sumner writes a defence of the so-called Efficient Market Hypothesis. I have noticed that the commentators already react quite aggressively to Scott’s unwavering support of EMH and my own personal experience is that people – especially people who themselves are active in the financial markets – will strongly oppose the idea of efficient markets. Why is that? Fundamentally I think that most people think of economics and financial markets based on their personal micro observations rather than based on economic logic. We all have met or heard of completely insane investors that far from can be described as being rational and if such people exists how can we talk about efficient markets? EMH is simply a very hard sell – whether or not it empirically is a good description of the world. Even though Scott and I agree that EMH probably is the best description of today’s financial markets it might actually be an idea to stop talking about EHM and instead confront the anti-EHM crowd with an alternative. Such an alternative could be Hayek’s description of capitalist market system as the best aggregator of information known to man. Recently I have been re-reading some of the key chapters in Hayek’s Individualism and Economic Order. The book is full is Hayekian classics such as The Use of Knowledge in Society and The Meaning of Competition and as well as some key chapters discussing calculation in socialist society. Contrary to neo-classical theory which is at the core of EMH Hayekian thinking is based on much less rigid assumptions (and is somewhat less stringent). At the core of Hayek’s thinking is that no social planner has the knowledge to allocate goods and resources in society. Preferences are individual and are changing constantly and so do natural conditions. We do so to speak not know the “model” of the economy. Contrary to this EHM and rational expectations build on the explicit assumption that the model is known. Hayek on the other hand would strongly object to the notion that the model is known – least at all by policy makers. Scott uses EHM to argue that since the markets are more or less efficient no central bank forecast will be able to consistently beat the forecast of the market and therefore central bank policy implementation should be build on the use of the market mechanism through NGDP futures. This makes perfectly good sense, but hold on for a second. What if the “model” of the economy is known why should we bother using NGDP futures when a benevolent central bank could just solve an optimisation problem and solve the model and implement the policy that would ensure the highest level of societal welfare? First of all, there would be a problem which social welfare function to optimize, but lets assume that this (non-trivial!) problem is solved. Then second, would you really think that we could and should leave it to central bankers to define what model is the “right” of the economy (most central banks today rely on New Keynesian models which both Scott and I think make very little sense). Take Scott and me. 90% (I changed that from 99%) of our thinking about monetary issues is the same, but I could come up with a few areas where we do not agree on the theoretical issues and even if we agreed about the model of the economy we could still disagree about the empirical size of the parameters in the model. This is of course why it is much better to leave it to the market to decide on the implementation of monetary policy through the direct and indirect use of prediction markets (such as macroeconomic forecasting, the implementation process and NGDP futures). But what if I was in a room full of non-economists and I had to explain why this makes sense. Would I start by outlining a mathematical model and tell them that markets where efficient (most people have no clue what efficient mean – neither do most economists) or would I tell a Hayekian story about how central planning is impossible and markets is the best aggregator of information? I surely would go with the Hayekian story. It is simply much more acceptable to most people than the EHM and radex story – even though Scott and I full well know that it is basically the same story. That said, it is therefore interesting that it is especially Scott’s Austrian oriented readers who so strongly object to Scott’s insistence that markets are efficient. They should really read Hayek because Hayek is exactly saying that the markets are significantly more efficient than any other form of allocation mechanisms. Yes, he is also saying some – in my view – weird things about mathematics, but overall Hayek thought that we could describe the economy as being efficient and that rational expectations would be a good approximation of the real world. Hayek’s classic description in “Price and Production” from 1933 of his business cycle theory is in fact very much an attempt (which fails in my view) to describe the business cycles within a fundamentally neo-classical set-up. Josh has written and excellent paper and I recommend everybody to have a look at Josh’s paper – maybe if we are lucky Ben Bernanke might also read the paper. After all the paper will be published in Journal of Macroeconomics. Bernanke is on the editorial board of JoM. PS Josh also has a comment on this on his blog. Update: Scott Sumner also has a comment on Josh’s paper.